In 2015, I was living in New York City and noticed a lump under my left armpit when I was in the shower. Nobody likes to go to the doctor to talk about strange bodily findings, so I waited for a few months to see if it would magically go away on its own. It didn't. I finally worked up the courage to make a doctor appointment. I showed the lump to my primary care physician, and he said, "Andrew, that's why you came to see me? Just change your deodorant, and you'll be fine." I'm a nice Jewish boy from the Midwest, so I trust doctors implicitly. Later that year, after moving back home to Kansas City, I was having trouble staying awake over the holidays. The fatigue was like nothing I had ever experienced. My mom finally convinced me to go to a walk-in urgent care to figure out what was keeping me in bed. I met a nurse practitioner, Brenda who I would realize later, saved my life. She listened to my symptoms - and oh, I happened to mention that lump under my arm. She quickly moved me to order an ultrasound, at which point I was in a whirlwind of thoughts. After a CT scan, a needle biopsy, a pet scan, and eventually an incision biopsy, I was diagnosed with diffuse large b-cell non-Hodgkin lymphoma. They weren't sure if it was stage 2 or 3, but it didn't matter apparently. The treatment would be the same. I even had a bone marrow biopsy – I don't recommend them! 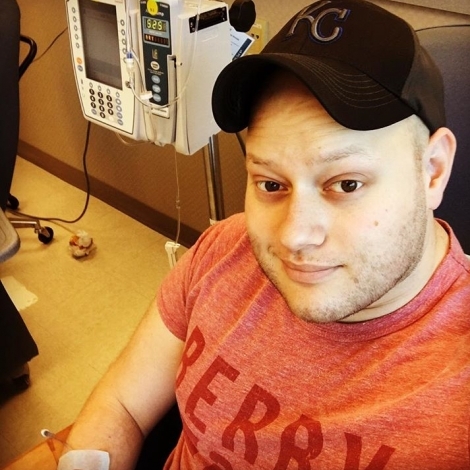 After six rounds of chemo, on an R-CHOP cocktail, and plenty of amazing care from The University of Kansas Cancer Center, I am proud to be a cancer survivor! My goal in telling this story is for anybody who doubts themselves, or questions their intuition, go to the doctor and get a second opinion. You have to be your own advocate. Doctors make mistakes, and you aren't annoying or pushy for taking care of your own health. You only have one life, so be diligent, and fight!